South West Four extends its reach beyond South London as they bring their club night Together back to Amnesia Ibiza for a series of parties. Kick-starting the season with an exclusive Ibiza launch party at Ministry of Sound on Saturday 6 June, Together will then return to Ibiza every Tuesday for a 16 date residency, before returning to the Capital to host an arena at SW4 on Sunday 30 August. With Fatboy Slim confirmed to present the Smile High Club, Together marks the second of their indoor stage announcements and the first for SW4 Sunday. 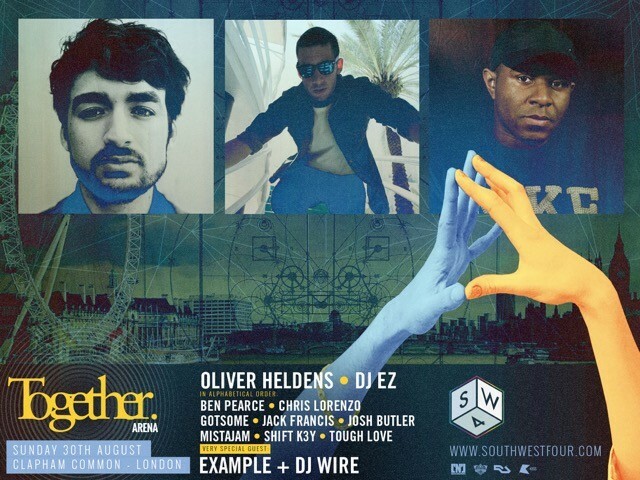 With Example + DJ Wire, DJ EZ, Ben Pearce, MistaJam and Shift K3y already announced for the stage, they recently revealed the final five artists who complete the Together line-up. Having signed to Spinnin’ Records aged just 17, Oliver Heldens has really raised his profile in the past 18 months. Recognised for his adaption of house and electro sounds, Oliver has enjoyed success following the release of ‘Gecko’ (which reached #1 in the UK singles chart), ‘Koala’ and ‘You Know’, featuring Zed’s Dead. Having just released his next summer track ‘Melody’ and with ‘Bunny Dance’ receiving support from BBC Radio 1’s Pete Tong, Oliver joins the event at the top of his game. Producer, remixer, DJ and Rinse FM host Chris Lorenzo has spent the past 12 months establishing himself as a UK electronic assets. Also known as one half of Cause & Affect, Lorenzo’s reputation has increased ten-fold thanks to the release of ‘Rhymes’ alongside SW4 artist Hannah Wants, in addition to releases on Dirtybird and Food Music. He's recently signed to Ultra following remixes of My Nu Leng on Black Butter and Disclosure on PMR. After arriving on the UK circuit with the heavily supported ‘Bassline’, Bristol-based duo GotSome have produced some exciting tracks over the past year. Their latest production sees the pair explore different sounds by teaming up with Wiley on ‘Vibe Out’. They are also signed to Defected and Chase & Status’ MTA Records respectively. The recent release of their summer record, ‘Just A Feeling’, featuring remixes from Sonny Fodera, Franky Rizardo and Phil Weeks is also evidence of their talents. London based duo Tough Love are made up of Alex and Stef and their weekly residency on Kiss FM and productions make them possibly two of the most inspiring artists around. Most noticeably the release of ‘So Freakin Tight’ has gone on to receive unconditional support from BBC Radio 1 and beyond, as has their ‘In the Name of Love’ with S-Man aka Roger Sanchez. Having arrived onto the scene in 2013, UK's Josh Butler first found success with his debut release ‘Got a Feeling’ on MTA Records. Since then, Josh has gone from strength to strength with countless dates across Europe including several for Sankeys Ibiza’s Tribal Sessions and Magna Carta parties. Production wise Josh continues with a catalogue of bass heavy sounds, as well as teaming up with fellow UK producer Bontan. Their ‘Be True’ tour recently culminated with a headline performance at London’s Ministry of Sound.